a fold of peritoneum extending from the stomach to adjacent abdominal organs. adj., adj omen´tal. greater omentum a peritoneal fold attached to the anterior surface of the transverse colon. lesser omentum a peritoneal fold joining the lesser curvature of the stomach and the first part of the duodenum to the porta hepatis. A fold of peritoneum passing from the stomach to another abdominal organ. /omen·tum/ (o-men´tum) pl. omen´ta [L.] a fold of peritoneum extending from the stomach to adjacent abdominal organs. colic omentum , gastrocolic omentum greater o.
greater omentum a peritoneal fold suspended from the greater curvature of the stomach and attached to the anterior surface of the transverse colon. an extension of the peritoneum that enfolds one or more organs adjacent to the stomach. See also greater omentum, lesser omentum. omental, adj. The portion of the omentum that is suspended from the greater curvature of the stomach and covers the intestines like an apron. It is the largest of the folds of the peritoneum. It dips in among the folds of the intestines and is attached to the transverse colon and mesocolon. It contains fat, prevents friction, and aids in localizing infections. The portion of the omentum that passes from the lesser curvature of the stomach to the transverse fissure of the liver. One of two double folds of PERITONEUM, the greater and lesser omenta, that hang down like aprons from the liver and stomach over the coils of small intestine. The omenta usually contain fat and are often effective in sealing down and localizing areas of inflammation of the peritoneum (PERITONITIS). Also known as the epiploon. pl. omenta [L.] a fold of peritoneum extending from the stomach to adjacent abdominal organs. Lace-like in pigs, carnivores and the horse, sheetlike in ruminants. 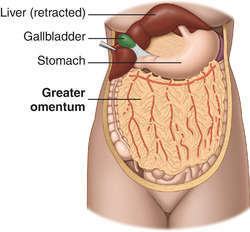 the part of the greater omentum attached to the colon. the part of the lesser omentum attached to the liver. the double fold of peritoneum derived from the dorsal mesogastrium that extends from the greater curvature of the stomach over the floor of the abdomen like an apron; poorly developed in the horse and well developed in ruminants. a peritoneal fold joining the lesser curvature of the stomach and the first part of the duodenum to the porta hepatis. 10) In patients with primary involvement of peritoneum, omentum, and mesentery by HD, liver function test remains normal. Hernial content may be omentum, small and large intestine, or stomach (6). We found serious adhesions of the omentum, mesentery and intestinal tract to the old mesh. 5%) and less frequently in the omentum, mesentery, bone, kidney, muscle, adrenal, brain, and pancreas. The most common sites of involvement were greater omentum in 71 (56%), followed by pelvis in 19 (14%), diaphragmatic peritoneum in 16 (13%), small bowel mesentery in 12 (10%) and serosal surfaces in nine (7 %) patients. The most common abdominal implantation site is 55% in the posterior cul-de-sac followed by 27% in the mesosalpinx, 9% in the omentum, and 9% between the anterior uterine wall and the bladder. Because omentum is pliable and mobile, it may be the first abdominal structure to herniate into the chest [1, 7]. They may also be founded buried in the omentum . The placenta, still attached to the omentum, was released with difficulty. Haemangiopericytoma of the greater omentum is a rarely documented tumour, with only 12 cases reported until 2003. There was intestine and omentum in incarcerated hernia bag. That happens because belly or visceral fat lodges in the spaces between your abdominal organs and attaches to the omentum, an apron of tissue draped behind your stomach muscles.